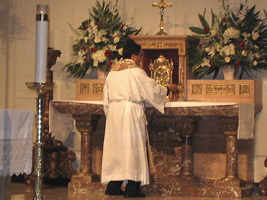 White, for purity and joy, is used during the great festivals of Christmas, Easter and funerals. Purple or violet, symbolizing penitence and mourning, is the color of the Advent and Lent. Green is for life, hope, and peace; it is used for seasons of Epiphany and Trinity. Black is for death and it is used on Good Friday.